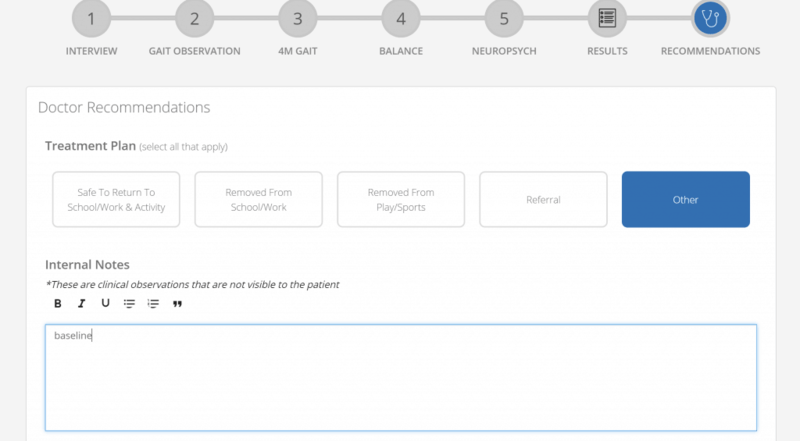 Depending on what type of SportGait Brain PhysicalTM you administered, the steps needed to check out the patient will differ. The following instructions are for Brain Physical Baseline evaluations. If a Baseline Evaluation has been administered, a facilitator does not need to hand the test results over to a Medical Provider. Instead, you will select “Other” and input verbiage indicating that a Baseline Evaluation has taken place. If a referral is needed or requested, this option may be selected in addition to selecting “Other”. Any additional verbiage can be added at the test facilitators discretion. PLEASE NOTE If a First Procedural or Follow Up Evaluation has been administered, a facilitator MUST hand the test results over to a Medical Provider, so the proper treatment planning and guidelines can be met. Once Treatment Plan options have been established and updated, you will select the blue “Check Out” option at the bottom of the screen. PLEASE NOTE that when you select “Check Out” all of the test results and treatment instructions are to be considered final. There is no way to edit the information once a patient has been checked out.